This week T and I created our Memorial Day craft project. I had several Americana themed craft projects in mind, but we selected this one because it is useful and doesn't involve fireworks. We are saving our firework themed project for 4th of July. So what did we make? 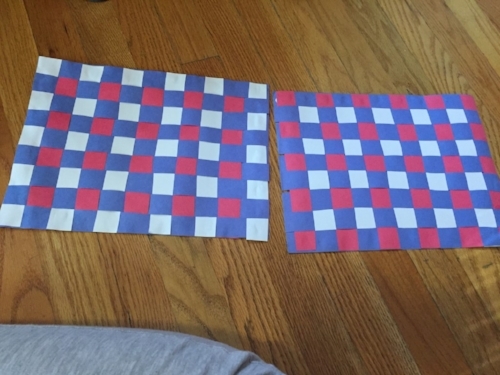 Red, White and Blue placemats. 1. First measure out 1 inch strips on the blue papers so that the strips will be the long way. Cut them out. 2. 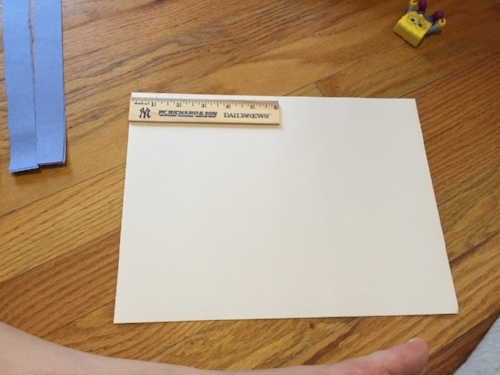 Measure 1 inch strips on the red and white paper so the strips are the short way. 3. Start with either a red or white strip. Take each blue strip alternately glue them to the red or white strip switching between on top and under the strip. See picture below. 4. Alternate weaving the red and white strips into the blue strips. Glue the ends of the short strips to the blue. 5. When you get to the last strip, glue the ends of all the blue strips to the last strip. We ended up with one extra strip each of the red and white when we completed the placemats. 6. Once completed and the glue has dried you can cover the placemat with contact paper so that it can withstand spills. Below is the finished placemats without the contact paper as the contact paper caused a glare. T had a lot of fun with this project. He especially enjoyed the gluing. Since he is also a big fan of cleaning, he also enjoyed wiping up any excess glue. We worked on the weaving part together. This was an easy project to complete while the baby napped. Since we plan on bbqing this weekend, these placemats will come in handy! You can also reuse them for Independence Day, Labor Day and any other patriotic celebration. 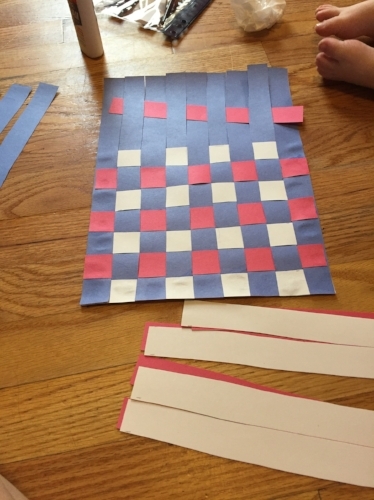 The project is easily scalable to make enough placemats for the whole family. I hope everyone has a fabulous Memorial Day Weekend!